Courtyard Marriott Las Vegas South is a non-gaming and non-smoking property. 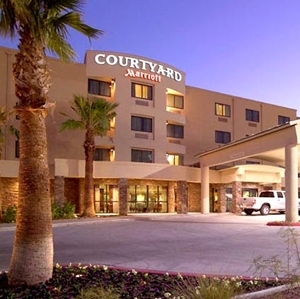 For those seeking an off-Strip hotel stay, Courtyard Marriott Las Vegas South can be a good option. The Hotel is quiet and well maintained. There is easy access to I-15. It is located close to the Las Vegas Strip and within a short drive to McCarran International Airport as well as near major retail shopping attractions. Many top class restaurants are nearby. Guests like the Hotel's express check in and check out, and find its property to be a convenient option for longer term stays. The distance of the Hotel from the Las Vegas Strip provides a quieter environment than some resorts. The Hotel's rooms are spacious and clean. Its accommodating staff are available for any issues. Courtyard Marriot South Las Vegas provides a courtesy shuttle to McCarran Airport, in addition to the Las Vegas Strip area and Town Square. The Hotel's business center has a messenger and copy service. High speed internet access is available throughout the property. There is a complimentary breakfast. The Hotel offers a full service bar and onsite restaurant, a 24 hour fitness room, pool & jacuzzi, and ample parking.